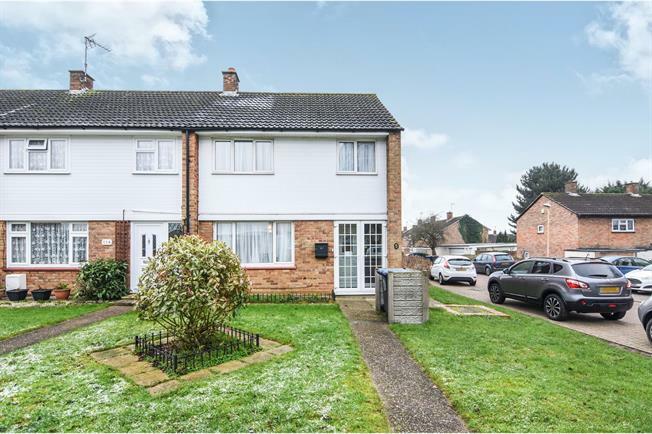 3 Bedroom End of Terrace House For Sale in Harlow for Asking Price £300,000. Well maintained 3 bedroom end of terrace family home. The property is presented in very good condition throughout with the ground floor accommodation comprising of a fitted kitchen with new boiler. The lounge has double glazed sliding doors to the south facing rear garden which is mainly patio with a divided lawn area and access to the garage. The 1st floor accommodation comprises of 3 bedrooms and the family bathroom and loft access via the landing. The property also benefits from an alarm system and double glazing throughout. This property has to be viewed to fully appreciate this property. UPVC back double glazed door, opening onto the garden. Double glazed uPVC window facing the rear overlooking the garden. Tiled flooring, painted plaster ceiling, downlights. Wood work surface, fitted, wall and base units, inset sink and with mixer tap with drainer, integrated oven, gas hob, over hob extractor, integrated dishwasher, space for. UPVC front double glazed door. Radiator, carpeted flooring, under stair storage, painted plaster ceiling, ceiling light.